Time spent at Amber Casino & Club is never wasted. It is our favorite place to play, everything we want in an online casino can be found here. The casino’s ultra-user-friendly design, together with the array of the sophisticated games, create an unforgettable gambling experience. Winning is a reality at Amber Casino! They will make you feel at home, regardless of the type of player you are. Amber Casino & Club is running on a new gaming platform, the Oryx Gaming Software. The company had a single goal: to create a powerful gambling platform, which will bring a whole new look and feel to the online gambling industry, and they have certainly achieved it. Not only does it deliver games with the finest graphic, sound and animation quality, but also a high level of security, which creates a safe and reliable gambling environment for its users. Fair gaming is a principle thoroughly respected at Amber. The casino is licensed in Curacao and regulated by the Curacao Gaming Commission. There are two options for playing at Amber: downloading the software or playing instantly. Either way you will become a part of an impressive gaming interface, where brilliant colours and the astonishing graphics make the difference. The virtual casino Lobby is simple and appealing, dividing games into 5 categories: Slot Games, Table Games, Video Poker, Card Games and Simple Games. Each of the sections contains other categories so that your search is as easy as possible. In addition to that, there is a Featured Games section in your lobby. Among the Card Games, Blackjack, Casino Hold’em and Baccarat are the most popular. Their designs are alluring – vibrant blue tables give you a genuine feeling of being in a casino. Roulette fans can choose between European, French and American Roulette. Other very popular games are the Video Poker’s Joker Poker, Aces and Faces, Jacks or Better and Deuces Wild. Slots fans enjoy a variety of up to 25 games, including Absolute Fruit or Lotto Is My Motto, which are progressive. We guarantee: there will always be something to entertain you here. Discover the amazing gambling universe offered by Amber today! Like all the great online casinos, Amber Casino provides its players with exciting bonuses and promotions. Playing here means having no limits and worries. There is a special section on their website where all the bonuses and promotions can be found, so check this page whenever you want to play and don’t miss any of the specials they offer. A warm welcome is given to each new player, namely a 200% Welcome Bonus, which triples your balance instantly. The minimum deposit required is €/$10. High-Rollers are greeted with €1000 in free money. Moreover, there are new promotions coming up constantly, so take advantage of them to feel that you are the king. Establishing a trustful relationship with their customers is a high priority at Amber and you will feel that for sure. At Amber, you have the chance to become a VIP player. It will give you lots of advantages and bonuses which are way higher than those on a newbie’s level. Another feature you will like here is the Comp Points, which can be redeemed later and used to play. The feature that we like the most at Amber is the Cashier Section. Here you can manage your deposits and withdrawals, view your transactions history, received bonuses and the Comp Points that you accumulate over time. You collect Comp Points each time you play at the casino. At Amber, you can convert them into real money, the amount of which depends on your contribution ratio. That means the more you play, the higher your contribution ratio. Loyal players benefit from very favorable ratios. The conversion ratio is always displayed in the Comps Section. You can also check your comps status and the previous conversions here. Amounts converted will be displayed under deposits. Amber offers its customers many deposit methods: prepaid cards, debit cards, online payment methods (e-wallets), wire transfer and bank draft. Choosing one is not difficult, as in the cashier’s section, you can easily choose the best method for you. The minimum deposit required is $10. 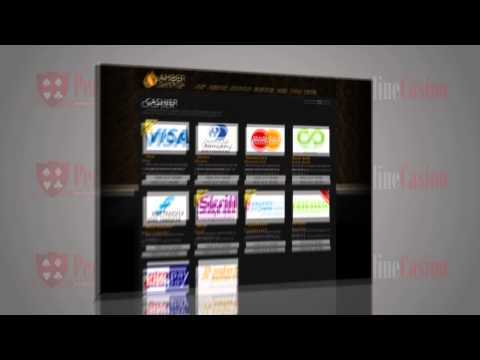 The available deposit methods are Skrill, Visa, Neteller, MasterCard, Poli, iDeal, American Express and Paysafecard. Processing times may take up to 2 business days. At Amber you will have many withdrawal options. We recommend you to use the same method for both withdrawals and deposits. You can withdraw money using Neteller, Skrill, Visa, MasterCard, Poli, American Express, iDeal and Paysafecard. The customer can choose between a few currencies, including British Pounds, Euros, Dollars, Canadian Dollars and AU Dollars. At Amber Casino, each game has its own wager limits. You can find out about them when accessing the game in the Games Table Limits section. As we’ve already mentioned before, you are the king at Amber and their main priority is to ensure that you get the best casino experience possible. This is why their customer support department is carefully organized and developed, so that whenever you encounter a problem, there is someone there to help you. You have access to a 24/7 live chat, where the fastest reply is guaranteed, but you can also call or e-mail (support@ambercasinoclub.com) an employee for assistance. You can have your first impression of the casino you are about to sign-up with right here. Take a little time and make the website tour with us! We like Amber Casino a lot. They have an easy registration process, and they give you straight away the option of either downloading the casino or playing instantly. They have an amazing welcome bonus and a very nice selection of exclusive games. So our question is this: what more could you possibly ask for? Sign up and start winning today!